I love a good kitchen renovation. I click through to check out pictures of just about any kitchen renovation I see posted on Pinterest, Facebook, Houzz, etc. And I DVR pretty much renovation show on HGTV. We’ve gone through two kitchen renovations now – in this house and in our Cincinnati house – and I’ve come up with five must haves for a kitchen renovation. This is important for two reasons: One, kitchens need plenty of counter space! And two, there should be plenty of seating in a kitchen. Our original kitchen in Cincinnati was just a workspace without anywhere to sit down. When Kalen or I were in there preparing food, the other person couldn’t sit to hang out in the kitchen if we wanted to chat and catch up on each other’s days. Seating in a kitchen is a must. Be creative in where you can put cabinet space. We have a small bit of space next to our pantry. It was too narrow for any standard lower cabinet, but it was the perfect – albeit unusual – spot for an upper cabinet. So we put an upper cabinet there and use it to store our blender. It looks great and keeps the blender off the counter. We also had a small sliver of space next to our microwave. We picked a really skinny upper cabinet to fill the space. It’s perfect for Advil, Band-Aids and other meds. Our breakfast bar is deep enough that we were able to place back to back cabinets underneath, meaning we have a set of cabinets that open up to our bar stools. It’s great storage for kitchen items we don’t use often: fancy dishes, a triple slow cooker and a roasting pan. 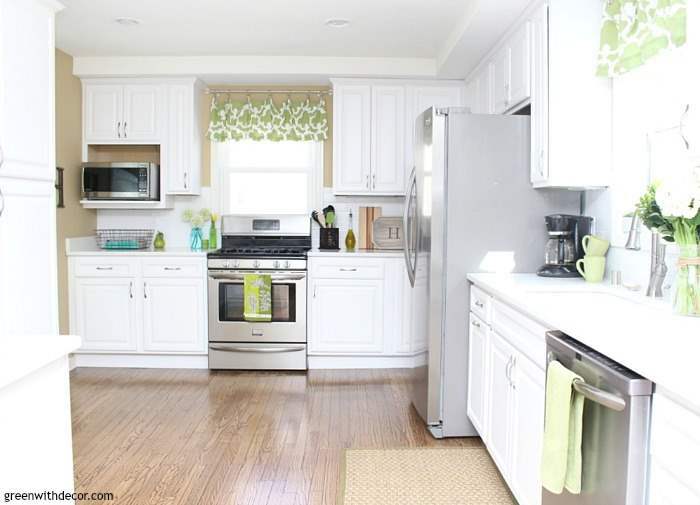 I love the clean and bright look of an all white kitchen, so white cabinets were a must. Everyone undergoing a kitchen renovation should pick cabinets in the color they want. Cabinets take up so much space in a kitchen. You’re going to be looking at them a lot, so they should be the perfect color for you. I’m a huge, huge fan of quartz. I love the look and feel of it. Since quartz is manufactured from crushed stone, it offers a consistent look. And it’s nonporous, so it doesn’t collect bacteria and is easier to keep clean. 5. If you’re going with stainless steel, go with smudge proof. Stainless steel appliances look great, but the smudges are enough to drive anyone crazy. Smudge proof appliances are the perfect option for a great look that’s easy to keep clean. What’s on your must-have list for a kitchen renovation? Curtain rod here, but they’re not always available. This one is similar. We are in the middle of a kitchen renovation. I so agree with your tips. I would like to add that I am getting two sets of big deep drawers instead of crawling under cabinets; I noticed you had drawers, too; and also a slide out drawer for a trash can, if you can afford to give up a lower cabinet! can’t wait for it to all be finished!! Good luck with your kitchen renovation! We love our big drawers and our garbage slide out drawer, too! Your kitchen looks beautiful! You really maximized the space so well. I didn’t know they made smudge-proof appliances! Pinning! Oh my goodness I love the quartz countertops! I just got married, so I’m living in a small apartment with my husband right now but if I ever have a house I hope the kitchen is as gorgeous as yours is! I so agree with the breakfast bar part–we created a makeshift one with ikea furniture in our kitchen and I love it! Thanks, Rebecca! What a fun idea for your breakfast bar! A must is having an organized work space, so that I can enjoy my time in the kitchen. Your renovation looks beautiful. My favorite color is green, I love the accents you have in the curtains and rug. Cooking is my hobby, so the kitchen is the favorite room of the house for me. Thank you for sharing! I love green! Thanks so much! I love the kitchen, too!